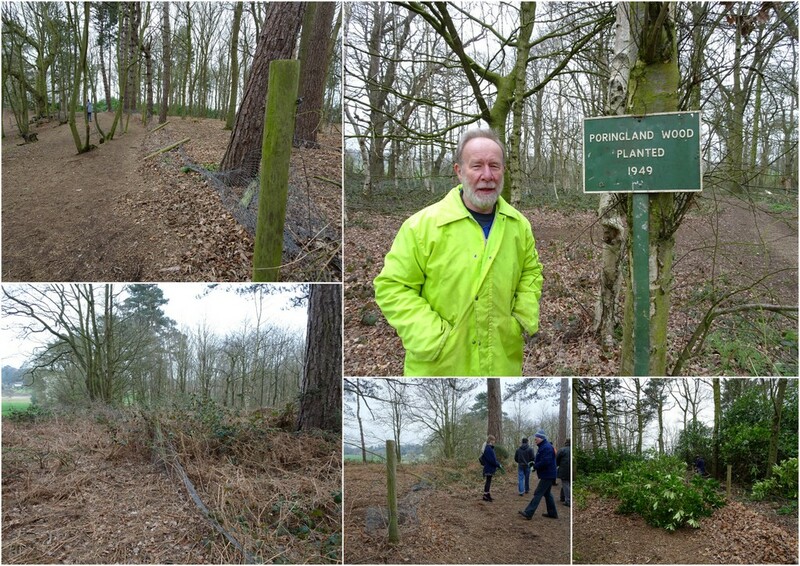 Our Volunteers have just completed the replacement of 150metres of fencing between the “old” and “new” sections of Poringland wood. The woodland is owned by the Crown Point Estate and South Norfolk District Council (SNDC) leases the “old” wood to enable public access, but the “new” wood remains private. The fence between the two sections had fallen down and the Norwich Fringe Project was asked to replace this by SNDC. So, we have had four days of working in Poringland with a lot of hard work and an opportunity to learn some new skills and techniques along the way. The “old” wood was planted in 1949 and the “new” wood in 1953. It is clearly not “ancient” woodland because it was planted in the year that I, and another of my fellow volunteers were born and nobody would describe us as ancient! 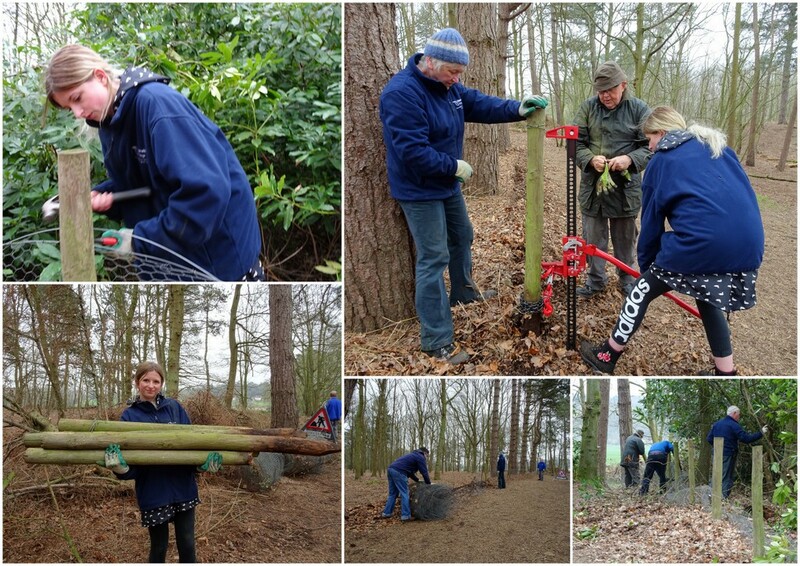 Our first outing on Friday 22 March was to remove the old fence and prepare the site ready for replacement. We walked along the fence line and Matt briefed us on the plans and our tasks for the day. Brambles had to be cleared from sections of the fence and some fallen trees and rhododendron removed to give clear access along the route. The old netting and posts were to be removed and loaded on the trailer to be disposed of. A lot to do and the team quickly got to work. Matt dealt with the fallen trees, and the bramble at one end of the fence line was cut away. The rhododendron was cut back, and the old fencing removed from the posts. Much of the old rabbit netting had collapsed but was still stapled to the posts. Matt showed Bonnie, Bob and Mark how to use the fencing pliers to remove the staples and strainer wires. The rest of us old hands were already experienced in dealing with fences. Once the wire was removed the old posts could be pulled out. We had our fence post puller with us to remove the larger and more stubborn posts, but some were broken off or could just be lifted out. At the end of the day we had cleared the old fence away ready to start replacing it. 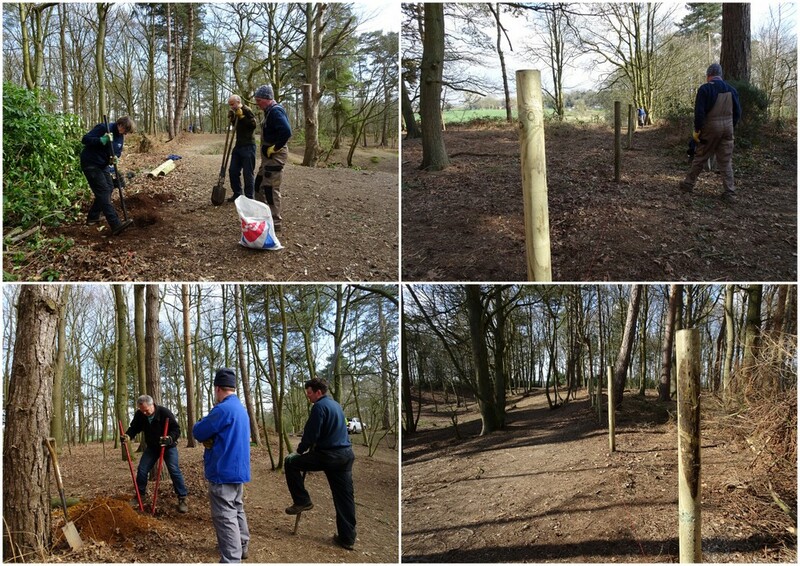 On our return visit on 28th March we built box strainers at each end of the run of fencing. These would take the strain and weight of the new netting. We had a team working at each end to construct the box strainers and although it was not a competition there is an element of this in friendly judging of each other’s work and offering constructive criticism. I have to say that the circular mortice joint to support our cross-strut was an almost perfect fit and a good example of what can be achieved with experience and patience. We had a new improved Gripple system to wire-up our box strainers. The cross-wires give strength and stability to the structures and we have used Gripples previously to connect these but haven’t really been able to get these tight enough. Gripples are small devices used to connect sections of wire by passing the wire through from opposite directions. The wire will only go through one way and is locked in place. Matt had bought a Gripple tensioning tool which pulled the wire through to achieve a really tight connection. After playing with the tool we were able to get a tauter fence. Having the right tool for the job makes life a lot easier for us volunteers. The box-strainers were finished, and we turned our attention to the other posts. This was a long run of fencing and not in a straight line, so we needed to install turning posts along the route. The turning posts are thicker posts that take the strain of the fencing and allows us to follow the boundary line and to turn corners. Two turning posts were needed and, as with the holes for the box strainers, it was hard digging because of the thick layer of large stones beneath the leaf litter. It was a bit easier putting in the intermediate posts since we could knock these in with the rammer. By the end of the day we had installed much of the required supporting infrastructure to complete the fencing. 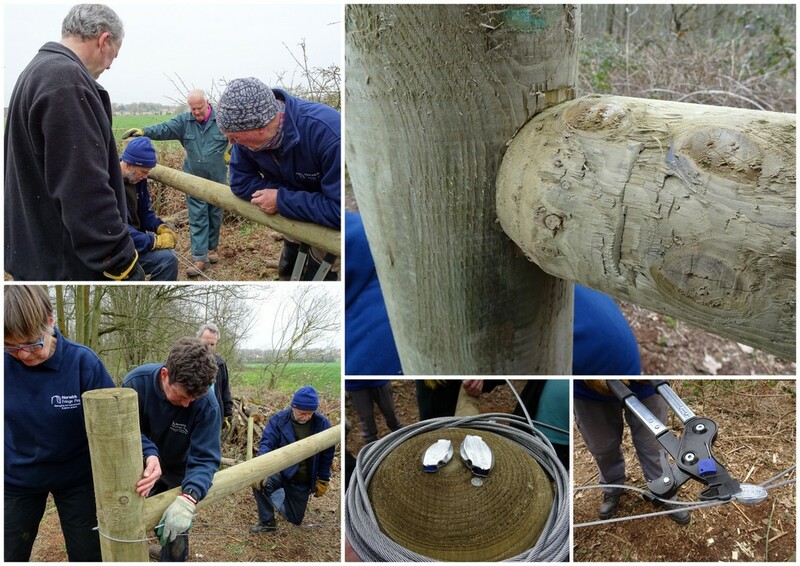 Volunteers returned on Friday 29th March to finish knocking-in the intermediate posts, fix the bottom guide wire to these and start installing the stock fence. 150metres is a lot of fencing and the rolls had to be joined and stretched to get a taut fence. The fencing is fixed to the front face of the intermediate posts but passed around the back of the turning posts. The stock fencing is made up of 6 strands of horizontal wires and at the end of each roll these had to be joined to the next roll with Gripples and tensioned with the new tool. It took a while and the volunteers shared the experience of “Grippling”. It was a long day, but all the fencing was in place and fixed to the posts. 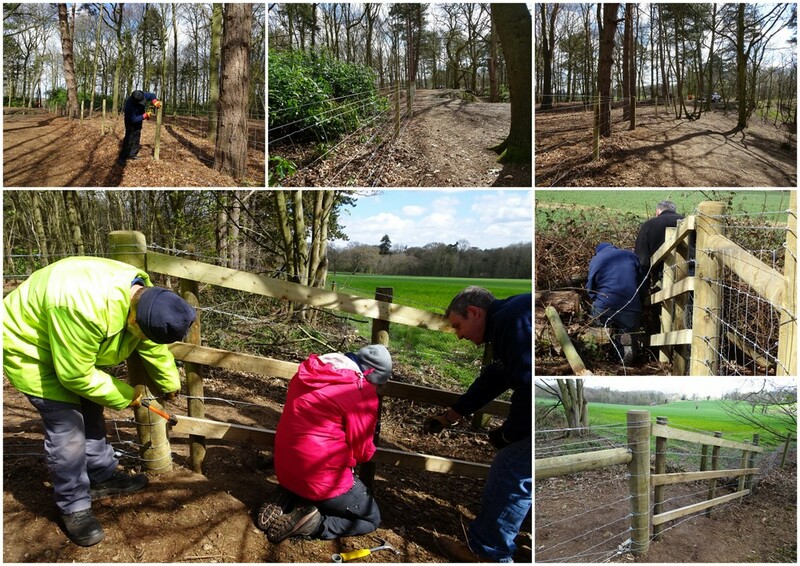 The final stage on Thursday 4 April was to install a post and rail fence to each end of the run of stock fencing to fill the gaps between the box strainers and the adjacent field boundary fences. We also added two strands of plain wire to the top of the fence to give additional stability. It was all done and dusted by lunchtime. And of course, we had cake during our four days in Poringland. We had doughnuts and Tiffin from Paula, triple ginger cake from Robert, cheese straws from Dave and lemon and poppy seed cake from Rebekah. I may have missed out some of the cakes and apologise to the bakers. I rely on Robert’s photos to remind me of what we had but there is a lack of evidence on some days – he must have been too busy eating to get a photo!